That’s what one of my long-lost half brothers told me many years ago, and I thought it was cool. It fit in with my insanity so perfectly, and I envied him. At the time, I was clinically psychotic. 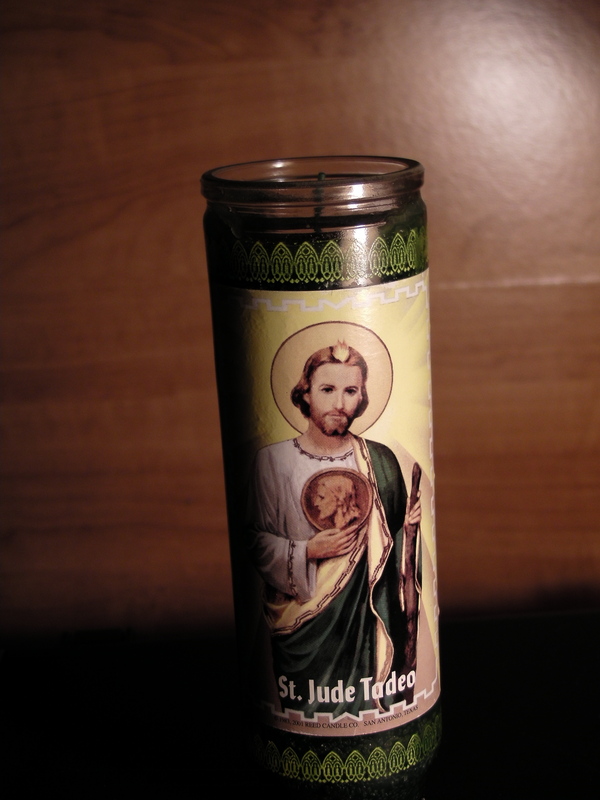 Here’s the prayer on the pretty St. Jude Tadeo candle I bought at the dollar store. Actually, that’s a pretty good prayer. All of us at one time or another feel like this. I often like to think we bipolar people feel these sorts of things more keenly…maybe “we” do and maybe “we” don’t. I don’t, can’t, presume to speak for any person living in bipolar other than myself, and I am very aware of my tendency to elevate my condition to an epic sort of stature, knowing full well that it’s no more epic than a host of other conditions, mental and physical. There are a lot of good words in the St. Jude prayer. Today, since I’m in a more healthy frame of mind than I was when I made the first post, I shall latch on to the most helpful word: Mindful. Mindfulness is the core skill taught in Dialectical Behavioral Therapy. DBT was created for Borderline Personality Disorder, but it teaches a skill set that is helpful to all. All skills in DBT come back to this one core skill, being Mindful. What does mindfulness mean? I can only tell you what mindfulness means to me. It means being fully present in your mind, body, emotions and environment. It is a means of grounding oneself and finding rest inside the turmoil. It means pulling back and acknowledging your feeling and accepting it without judging it. It’s not a good feeling or a bad one, not right or wrong, no matter how strong it is: It is what it is, nothing more or less. Say that I feel anxious. I also feel the chair against my body, the responsive keys under my fingertips, and I hear the keys clicking and the rain and thunder outside. I concentrate on these things, allowing the feeling to exist but not allowing it to take over, or to represent things that cannot be helped or may be “despaired of.” Rather than allowing the anxiety to direct me to worry over whether there will be a job for my husband, or dwell on the fear that a horse will colic, or obsess that posting this stupid blog caused people to un-friend me on Facebook, I simply accept the feelings of anxiety as I accept the smell of the rain and the wet dog under my desk. I am Mindful. And the anxiety feelings often will slip away. There is also a technique of breathing, which is pretty much the same as any relaxation technique of breathing, I think. You breathe deep, and concentrate on it, and you let the thoughts in your head be there and go on their way, without judging them or berating yourself for having thoughts. 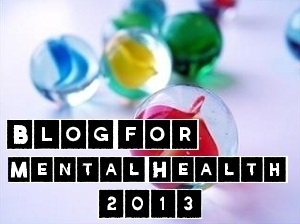 I am still not sure what I am trying to accomplish with this blog. I certainly don’t intend for it to be a vent for negative feelings, though that is what started it. I am sure the good people at the National Alliance on Mental Illness would not look approvingly on my previous post, although I stand by it as expressing a valid point-of-view, that is, one point-of-view among multitudes. For those who might wonder, yes, I have dealt with cancer. More than one member of my family has battled it. Not me personally. But I live with chronic, often debilitating pain, and I have experienced at least part of my share of pain so severe that hospital medication is inadequate to assuage it. More troubling to me is that after all that spouting off about the injustice of being misunderstood and stigmatized for a mental disequilibrium, I find myself on the other side of the river! I wish to cut all ties with someone because of that person’s behavior, and I know that behavior is at least partly the result of the heinous bipolar mania that the person is currently trapped in. What a hell for this individual, and me over here a freakin’ hypocrite. I want to help the person, and the person does not appear to be managing the condition responsibly. I, who should know how to help, can’t figure out what I should say or do. Whatever it is would be proactive on my part, because the person in question doesn’t call me and isn’t really that big a part of my life. Maybe I am questioning whether it’s my place to jump in. Maybe this person has a support system of friends and doesn’t need me. But I expect this individual is suffering alone, alone as I was, because except for a very few exceptional people, no one wants to be around a person acting like this unless they are paying them money. This individual is pushing people out of connection, whether intentionally or not. I can relate to this person. Oh, can I! But there are certain attitudes I do not want to enable by agreeing with them. I do appreciate the quandary my manic depressive episodes place people in. Most of the people avoiding me during the worst of it did not have the tools and perspective that I have, so how can I blame them for jettisoning me, if I can’t figure out what to do here and now? Well, until I work it out, I can pray.